Financing a vehicle can seem like a complicated process. We at Volvo Cars of Perrysburg try to make it as simple as possible by going over every detail so you can make an informed decision when you buy your next vehicle. 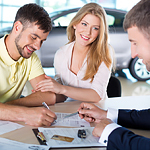 Getting your first auto loan can seem intimidating if you don’t understand financing terms. Allow us to provide a little help.